Are you ready for Block 2 in the Autumn Jubilee Quilt Along? Our giveaway sponsor today is Connecting Threads! 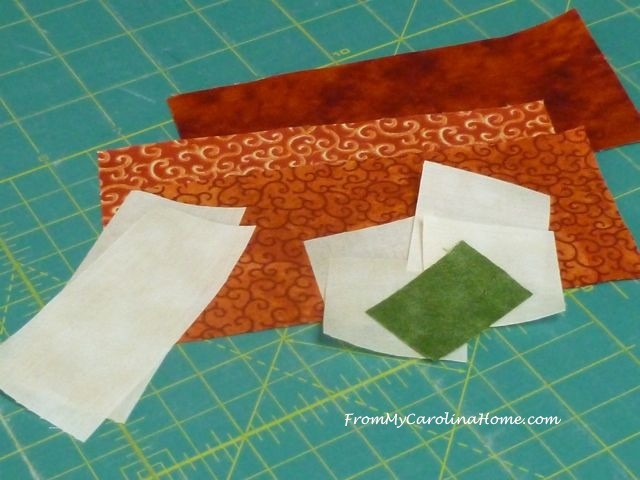 You’ll need to gather your orange fabrics for this one, along with more background scraps and just a bit of green. The second block for the quilt along is a pumpkin design. The pumpkin block finishes at 6 inches square. Sew the green scrap between the two background strips, short sides matching, right sides together. Press toward the green. 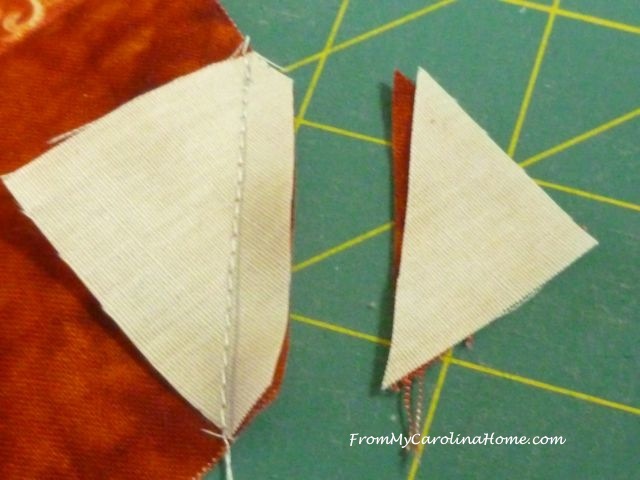 Sew the orange strips together on the long sides. Position a 1-1/2-inch background square on each corner and sew diagonally across the square, like making a snowball block. Be careful to sew exactly on the line or you may end up with this. Trim the seam allowance to 1/4-inch. Press to the orange side. Sew the pumpkin to the stem. Square up to 6-1/2-inches. Make one pumpkin block for the mini quilt this week. 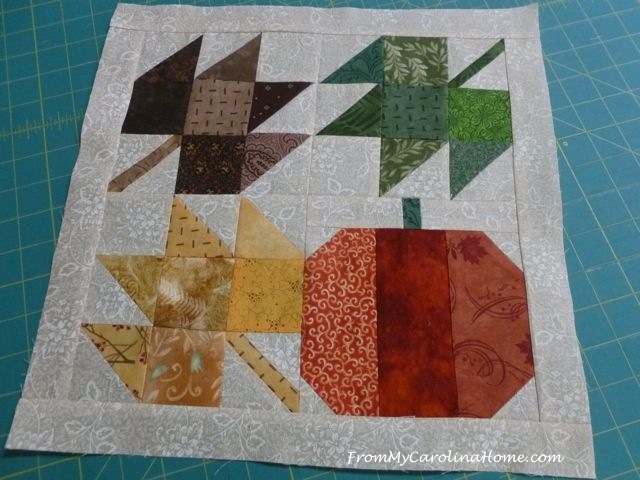 Arrange three leaves of different colors (or three multi-color leaves) and one pumpkin block in the layout below. Vary the direction of the leaf stems. Add a border of 1-1/2 inches wide background fabric. Be sure to measure your borders, they should be two strips of 12-1/2-inches long, and two strips of 14-1/2-inches long. Quilt as desired. 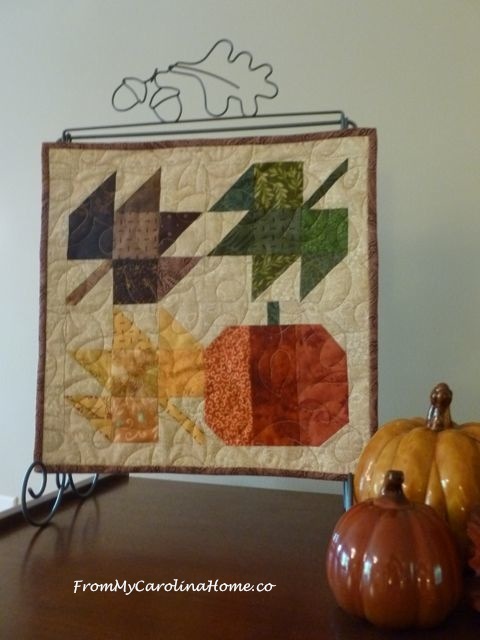 I used my favorite fall pantograph with leaves and pumpkins. Before binding, add hangers to the top edge of the back for your stand. Leave these off if you plan to use it as a candle mat or on a table. 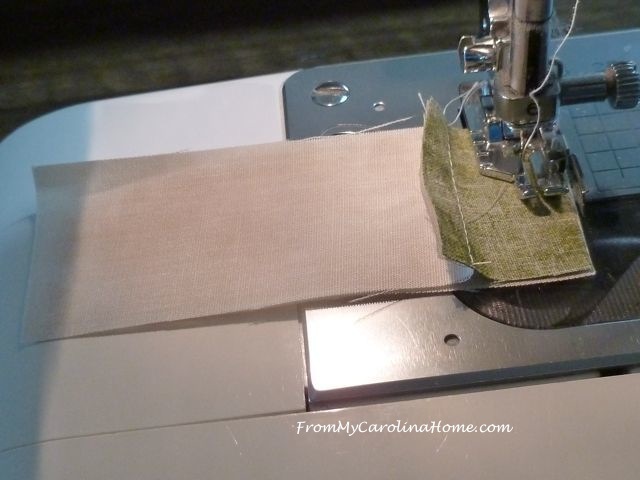 Start with two pieces of backing fabric cut 1-1/2 inches by 4 inches. 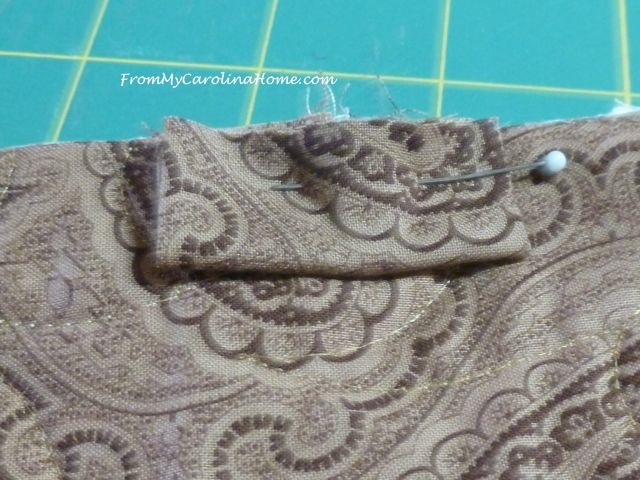 Bring the short sides together and sew with a 1/4 inch seam. Press with the seam open in the middle of one side. Turn right side out. Fold up so the raw edges are together with the seam inside, and press. Sew to the top edge of the backside of the quilt, about 4 inches in from each side, before adding the binding. See HERE if this doesn’t make sense. Bind as usual. Hang on your mini quilt stand. The final size of the mini-quilt is 14-1/2 inches square. 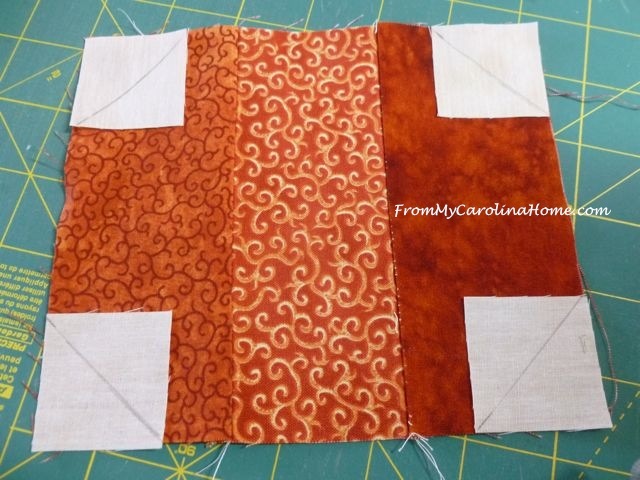 If you prefer, you can leave the borders off and just bind the blocks to finish at 12-1/2 inches square. Now the fun part, add a face to the pumpkin using black wool or felt. I cut out the shapes, and just pressed them onto to the pumpkin, then pinned them from the back. Now, when Halloween is over, I can remove the wool face and still use the mini-quilt through Thanksgiving. I’ll store the face pieces by pinning them on the backside of the mini-quilt so I won’t lose them for next year. For October, the pumpkin header on the stand reminds me of the Great Pumpkin Charlie Brown video, remember Linus rolling the big pumpkin around the fence? You’ll need more leaves and pumpkins for the layouts for the next two projects, so keep making them this week! Next project will be next Friday. You’ll need eight more pumpkins for the next two weeks. The last one in this pic was used in the small project below. Today’s post giveaway is from Connecting Threads! They will send a mini-quilt stand with a leaf and acorn topper to one lucky commenter on this post, just like the one in the picture on the left! Just visit Connecting Threads, then come back and leave a comment on this post with your pick for your favorite fabric collection from their current offerings. The drawing will be held November 1, so you have plenty of time to enter and tell your friends! Followers of my blog can leave a second comment for a second entry. Giveaway was in 2016. New readers, welcome! Please have a look around, I do a lot of different things here. 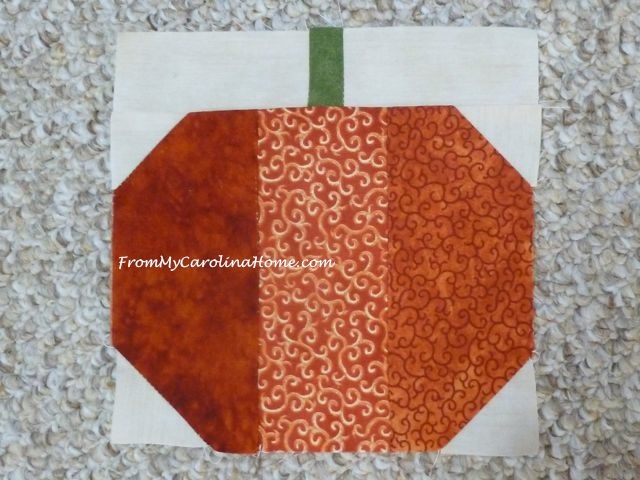 If you only did one leaf, make a hot pad or mug rug with your pumpkin from today. Position the leaf and pumpkin with sashing of a pretty autumn print. Quilt with Insul-Bright batting, also available at Connecting Threads. 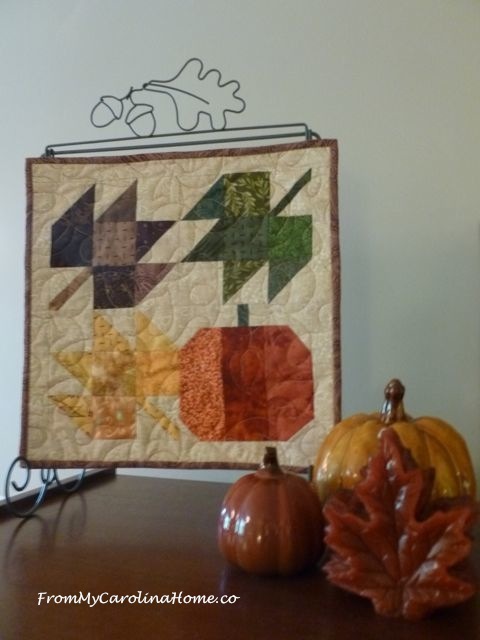 If you missed the post last week showing the leaf block, click on Autumn Jubilee Quilt Along. And upload your progress pictures to the Flickr Group Autumn Jubilee! For next week, you’ll need more leaves and pumpkin blocks for the runner. The choice of how many is up to you, but I think you will be happiest with at least four pumpkins and eight leaves. I’ll show you several designs, so happy sewing this week! 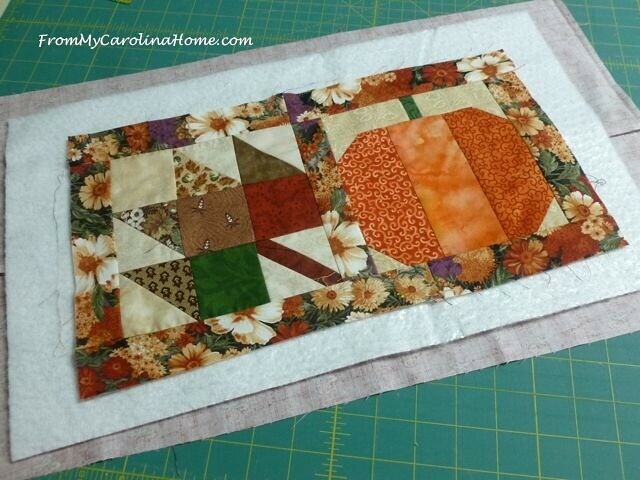 Update – Click HERE for the table runner using these two blocks. What is your favorite collection at Connecting Threads? I like the Lion’s Share collection by Cotton & Steel. MODERN & GRAPHIC !! I follow you via email. Thanks!!! Oh! I meant to add that I love your Fall mini quilt!! Scarlett is my favorite collection-love those bright reds! Modern Deco is my favorite Connecting Threads fabric collection. It’s hard to choose because I like soooo many. I like the quality of there product and the price fits my budget. The first picture that popped up was the beautiful reds, Scarlet! Love them! Oh I’m sooo looking forward to the fact that there is rain in our forecast this weekend as I want to make some of these leaves and pumpkins!! Sooooo cute! And your little jack-a-latern idea…ingenious!!! Oh, how fun! Can’t wait to get to the pumpkins, I made 8 of the leaves, but mine are 8″, not 6″, I’ll have to play with pumpkins so they are 8″. I used some diagonal blocks I already made a few weeks ago! Thank you to Connecting Threads for the awesome giveaway! I live their Christmas Remembered Sampler Fabric! I follow on Bloglovin and email! Love the Spooks and Spells for Halloween. 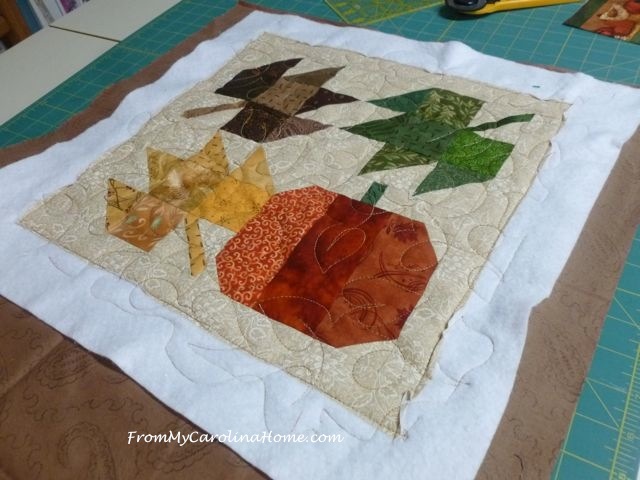 I follow you on Bloglovin, love the autumn jubilee mini quilt. I like the Spiced Potpourri from Connecting Threads. I love their site and their fabric. Great to do business with and very generous with their cutting of fabric. Great tutorial and small projects. Love the Casablana or Scarlett collection. Thanks, these are great ideas. I like their newest line currently which is Scarlett! Love red, my favorite color. So far I have 5 leaves made and I just LOVE the pumpkins. Can’t wait to get started on those! Thank you. They have such great fabric selections, I order from them a lot. I like the Folk Blossoms and would love to make a quilt out of that fabric line. Their sample packs make cute throws and I use the Christmas ones for ornaments. Wonderful mini quilt. 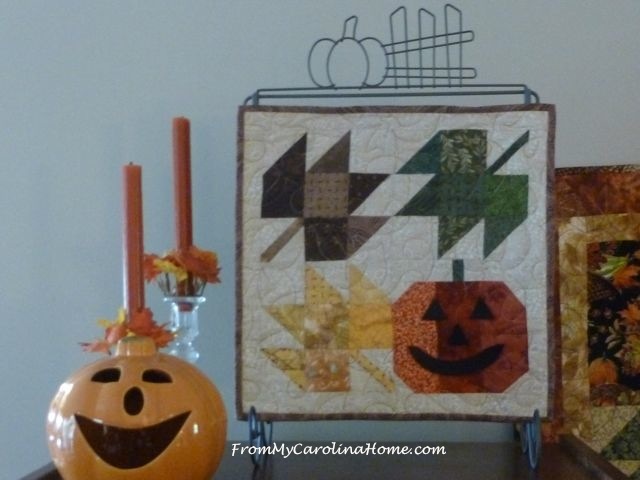 I love the fall or Halloween quilts. Having trouble finding spots to put them in! I love connecting threads, Scarlett. I love the Dance of the Dragonfly collection. I’m always drawn to combinations of blues and greens; with the metallic highlights this i’s like having Tinkerbell dancing across your quilt! I only recently found your blog and I so enjoy it. Thank you for your creative ideas and beautiful photos. I look forward to you posts every day. I have always wanted a mini quilt stand and this is one I love! Yours is the perfect mini to hang in this season. I really like Quilter’s Candy Summer Solids Samplers and I already have a quilt pattern in mind to sew with it! Thanks! Carole, I follow your blog on Bloglovin’. Casablanca is my favorite. Thanks so much for todays project as I have the stand for it and hope to have it on it today. Thanks again for getting us into fall with such fun. I like dance of the dragonfly…beautiful blues! What a fun fall project. I have 10 or 12 leaves made, ready to make pumpkins–these could be made into placemats. My fave connecting threads collection is Rhoda Ruth, I think…..actually I like them all! Hard to choose. Their quality is fantastic, also, in case anyone is skeptical. Happy quilting! CT is my favorite supplier:). Right now I am liking the Hazel collections. Love fall leaves and the orange pumpkin is bright and cheery. Connecting threads is my favourite on line shop. The new Hudson Valley collection looks wonderful. Thanks for the autumn jubilee blocks ! And.. I follow your blog by email! I follow via eMail, and am enjoying the QAL. I’ve been wanting something with pumpkins. I love the idea of removable face pieces!! I like a lot of the fabric collections on Connecting Threads, but for now I’ll choose – Patriotic Minis by Connecting Threads. Right now I really like their berry fresh collection. I’m excited to see the rest of these projects! Really like “Scarlett” ! Thank You for sharing+this giveaway! My favorite collection is Dance of the Dragonfly. I am a subscriber and I think the pumpkin spice mini quilt is adorable. Wilderness expressions with the sealife is one of my favorites. Connecting threads favorites Hudson Valley & Christmas Remembered holds special meaning when I think of name of this collection 2011 our last Christmas with our son & my Mom .thank you for sharing so many wonderful ideas,patterns and as always fun offers . The Hazel collection is my favorite for the time being. The Little Sweetheart quilt kit is adorable! 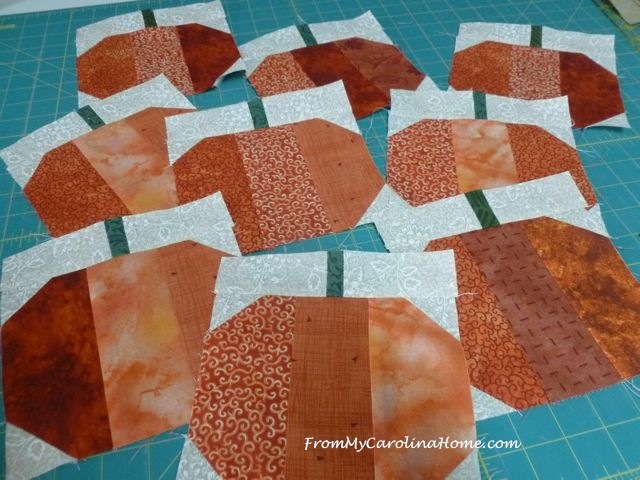 I’m loving the maple leaf and pumpkin quilt along. I’m starting it today! I like the Enchantment and Juliette collections–either are beautiful. I’m always attracted to red; I love the Scarlet collection! McKenna Ryan fabrics will always give me one that I really like, and Sandy Shores is my pick for today. Carole ,I follow you on my blog with Blogger. This is another fab block, and I have enough of the background to make at least one block today. Love your mini quilt!!! In their shop I love Porto With Love bundle!!! Thank you! I am a follower with bloglovn!! Ok confession – I am a CRAZY cat lady…so Cat Lady collection it is. Hard choice! I really narrowed it down to two: Days of Christmas and Wild Flowers and Honey. I can’t get it any narrower than that! Thanks for the pumpkin pattern. I think I can get at least this much done! I had fun making four maple leaves and a pumpkin this week! Connecting Threads has so many choices – it’s hard to decide. But I do love the Hazel collection of fabric! I like the spiced potpourri collection – also think your quilt along is great as I may actually have fall decorations b/c of it !! I like the Spiced Potpourri collection at Connecting Threads. Your Autumn mini is wonderful. I need to try your tutorial for the pumpkin block. Using felt for a Halloween face was inspired! I am a follower via RSS Feeds. The new Scarlei collection is gorgeouss! I love Sugar Plum. Visions of things I can do with it or now dancing in my head (sorry about that – couldn’t resist). Love the reds of Kinderfolk. Serenity 22 is my favorite. I am following your blog with bloglovin. Fun block and I certainly have plenty of oranges! I think I will piece them with my bigger leaf blocks into a banner /table runner. Away at PIQF until Sunday, but will get cuting and sewing soon! I like CT, maybe Cutting Green. I miss some of the great 30’s they had like Canning Days. Great Pumpkin. I love Connecting Threads! Any fabric I have bought has been top quality. Kits have plenty of fabric to more than finish the projects. I really like the Scarlett collection 😊. Sometimes it is hard to find nice reds. Almost finished my first little mini wall hanging and looking forward to next Friday! I like the new Scarlett Collection and would love the Scarlett Sampler Charms! Bloglovin follower: Nicole Sender & new e-mail subscriber! I love the Spice Potporri, lovely florals, for any season. I follow on the Feedly app. My stash is short on reds so I’m eyeing the SCARLETT collection. These are super cute!! Thanks for the tutorials!! I saw the Scarlet collection earlier and loved it! I follow via Bloglovin’! The pumpkins and leaves are great! 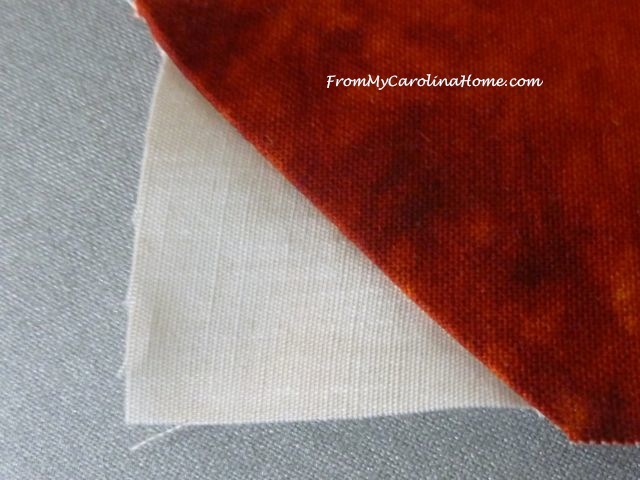 My pick would have to be Storytellers, a Nancy Gere collection…..gorgeous browns, reds, blues, sages and neutrals….yummy! I was surprised at the really good prices. Thanks for a chance to win…..love the leaves and pumpkins…..
Great mini–I think I need to make some pumpkins! I like their Juliette collection. I follow you by E-mail or Bloglovin. You realize you’ve given us an impossible challenge with all the lovely fabrics on the Connecting Threads site! If I have to choose, it would be either shimmer 2 or black and white by northcott. I’ll be starting my autumn jubilee challenge later this week. Thanks for this fun quilt along. I love the Scarlett collection–it gets me in the mood for Christmas sewing–the reds and whites are so crisp and clean looking! My favorite? WINTER RHAPSODY – and would love to win the mini-quilt stand. I am a follower of your blog via your newsletter. Oh my…. love this block… I just need to be able to quilt 24/7 instead of work…. I just viisted your flicker group and was inspired by all it’s Fall wonderfulness!!! Hapdy Day Carole! I really love the Beverly Park collection! Oh, how cute and simple. Thank you for sharing. Your fall mini is just adorable and the hanger adds the perfect touch. I love using mini quilts to accent all the seasons, and fall is my favorite. Christmas Remembered is my favorite collection now. I might change my mind when I go through the pages again, ha!! Oh Country Threads new Hudson Valley collection caught my eye immediately! Something about it I just LOVE!!!!!! Spiced Potpourri gives me the warm, traditional feel I look for when making Autumn pieces. But Spooks & Spells is a fun, seasonal collection as well. So hard to choose! Thanks so much for the quilt along – I’m thinking Christmas presents :-). I follow by your blog by email. I love the sugar plum collection by Robert Kaufman. I’ve been shopping a lot of Christmas fabrics and love the blues and snowflakes in his collection. Thanks for the chance to win! Beverly Park or Pen and Ink. Both of those thrill me. These are fabulous. I LOVE your pumpkin blocks. I like Les Fleurs by Cotton and Steel.